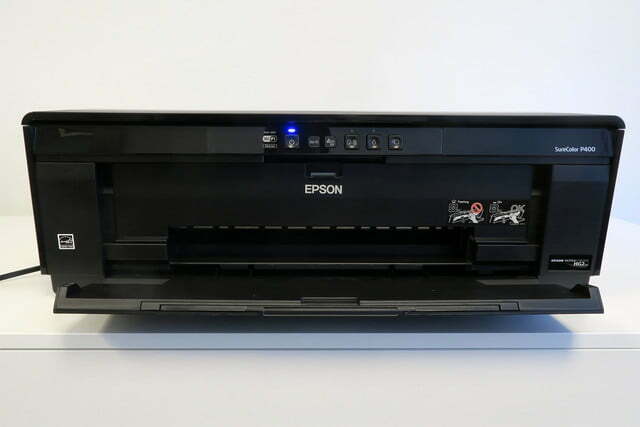 Epson's SureColor P400 brings professional photo printing to a price you can afford. With more and more reasonably priced DSLR and mirrorless (and even some smartphone) cameras capable of capturing high-resolution images these days, it opens up the opportunity for high-quality outputs. Why buy art when you can print your masterpieces yourself, and hang them on the wall? Of course, you’ll need an inkjet printer that can handle more than letter or legal-sized paper. What you want is a wide-format photo printer that’s designed for such a task (think, multiple color ink tanks). But many of these units are on the pricier side. 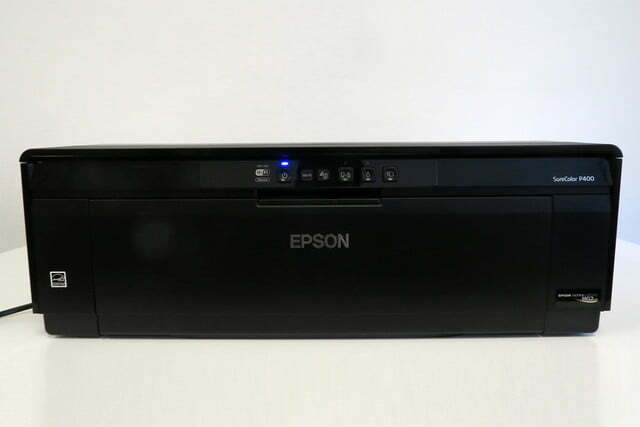 From the low-end consumer all-in-ones to industrial machines, Epson makes a lot of photo printers or printers that are capable of printing photos. The SureColor series is where you’ll find Epson’s high-quality photo printers, ranging from models that can output advertisement posters to smaller 8 x 10s. The P400 is at the very low end of the SureColor series, but that doesn’t mean it’s inferior. The P400 is at the very low end, but that placement on the totem pole doesn’t mean it’s inferior. Think of it as the baby brother to the P600, one of our favorite photo printers. In fact, the two are very similar, except the P400 is less expensive because, mainly, it has one fewer ink tank. And like the P600 (or any wide-format photo printer, really), the P400 is large. It weighs 27 pounds – not so heavy that you can’t unpack it from its ginormous box, but it is bulky. The printer itself is rather nondescript: With the top-rear paper feed and the front output tray folded, it’s simply a large, black rectangular box measuring 31.4 x 24.5 x 16.5 inches. It will not fit on a desk, especially when the paper input and output trays are extended, so consider getting a small table or stand for it. Physically, it looks almost identical to its P600 big brother, but the P400 lacks a color touchscreen. The SC controls run along a strip across the top of the front panel, and include (from left to right) a network status indicator, power button, Wi-Fi connect button, paper feed/cancel button, ink button (which moves the printhead to the “replace ink cartridge” position), and roll paper button for loading and unloading roll paper. There are also indicator lights for power and ink status. The P400’s paper handling is also similar to the P600’s. The paper feed has a capacity for 120 sheets of plain paper, or 30 sheets of photo paper. It can accommodate paper up to 13 inches wide and 19 inches long. Another feed located on the printer’s rear panel can support 13-inch-wide roll paper. Also located at the rear panel is a place to attach the manual feed tray, used for fine art papers that are too heavy for the standard feed. Finally, another feed is behind a pull-down panel on the front of the printer, located over the output tray. This input is used for feeding poster board or very heavy fine-art paper. This is also where you feed the tray used to print on printable optical disc media. Similar to the other printers in the SureColor family, the P400 uses Epson’s pigment-based UltraChrome HD inks. The seven colors and Gloss Optimizer cartridges (Epson describes the P400 as an eight-color printer, although that includes the Gloss Optimizer) have a bit less capacity than the more expensive SureColor models – 17ml versus 25.9ml in the P600, for example. Ink colors consist of two blacks (Matte and Photo Black), Cyan, Magenta, Yellow, Red, and Orange. These provide the P400 with a wide color gamut. Pricing on the ink cartridges runs about $18 each. 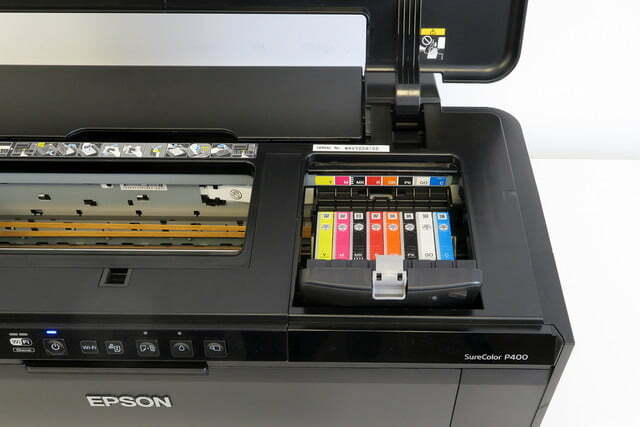 Epson does not provide yields for the cartridges, and the rating would be useless in most cases anyway since yields are completely dependent on what you print and what colors appear in most of your print. Depending on the size and quality of the prints you generate, figure at least several dollars per print – $1-2 for a 8 x 10 print, $3 and up for a 13 x 17 print – when the cost of the paper is figured in. This is true with just about every prosumer-class wide-format photo printer, not just Epson’s. Setup is easy: Plug it in, power it on, and load the ink cartridges. Before you can use it, the P400 goes through a priming process that takes 6-10 minutes. While this is going on you can download the print driver from Epson’s website, as well as any additional software or firmware updates. When it comes to connecting the printer, you have several options: USB 2.0, Wi-Fi (with WPS support), or wired Ethernet. 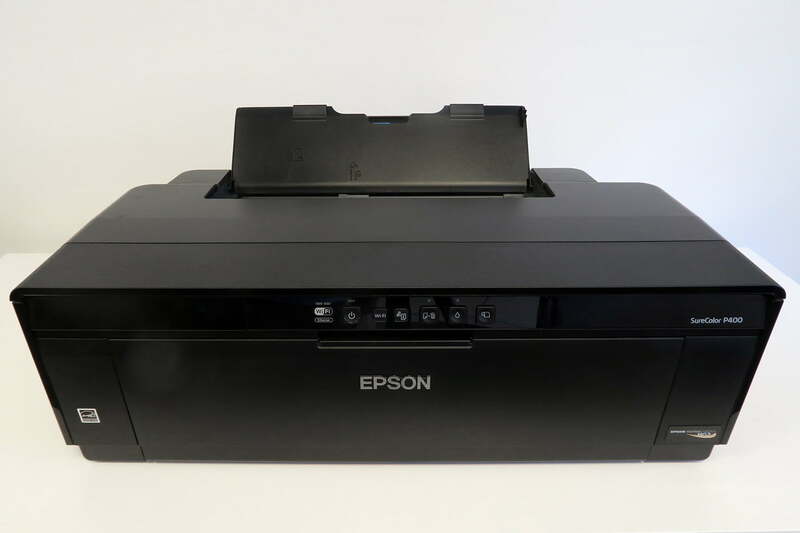 You can also print to the P400 using a mobile device and Epson’s iPrint Mobile software. Unlike the P600, the P400 does not support Apple AirPrint or Google Cloud Print. One word of caution: If you are using USB to connect the printer, be sure the cable you use is rated for USB 2.0 or 3.0, and pay attention to the cable length. Initially, we had a problem with some of our test prints freezing halfway through. With extensive troubleshooting and support from Epson, we finally discovered the problem was the 15-foot cable we were using. We didn’t have a problem with this cable in the past, but 15 feet is very close to the length limit for a USB cable (16.5 feet), and when we switched to a 10-foot cable, the problem disappeared. You can produce near-gallery-quality photo prints with excellent color accuracy and saturation. As with most wide-format photo printers, it takes a while. Printing an 8 x 10 photo can take a minute or two, and a Super B (13 x 19 inch) can take several minutes more. Print settings in the driver have a large influence on both print speed and quality, too. 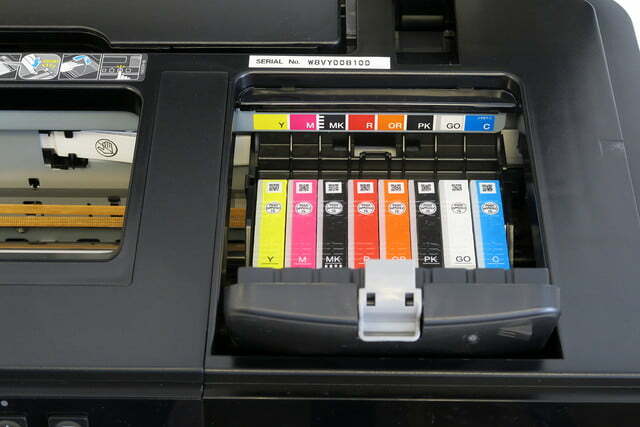 Furthermore, if the printer needs to switch back and forth between the two blacks, it can add considerable more time. The P400 uses Epson’s Professional Print Driver, which has extensive settings for different aspects of the print process and comes with ICC Print Profiles for many of Epson’s Fine Art papers. Most paper vendors provide ICC profiles for their particular papers, but you’ll need to look those up – not difficult with a quick Google search. If there’s anything tricky about photo printing, it’s probably picking the right settings for the job. We used Epson’s Cold Press photo paper for our testing and were very impressed with the output. Colors were very accurate, and saturation was excellent. If you want a bit more pop, you can choose the “Vivid” selection in the print driver, though our testing was performed with the default print driver settings for the paper type. Like in all our photo printer reviews, we didn’t bother with printing on regular paper. Why? Because this type of printer isn’t designed for homework, drafts, or any text documents. Not only would it be overkill, it would also be slow; you will, however, get some amazing-looking text documents. Stick to fine-art or photo papers. The box contains eight 14ml “starter” ink cartridges (standard cartridges contain 17ml); mounting brackets to accommodate 13-inch-wide roll paper; a large plastic single-sheet guide that clips onto the rear of the printer (for fine-art media when using manual feed mode); a tray for printing onto compatible optical media (CDs and DVDs); and instructional guides. 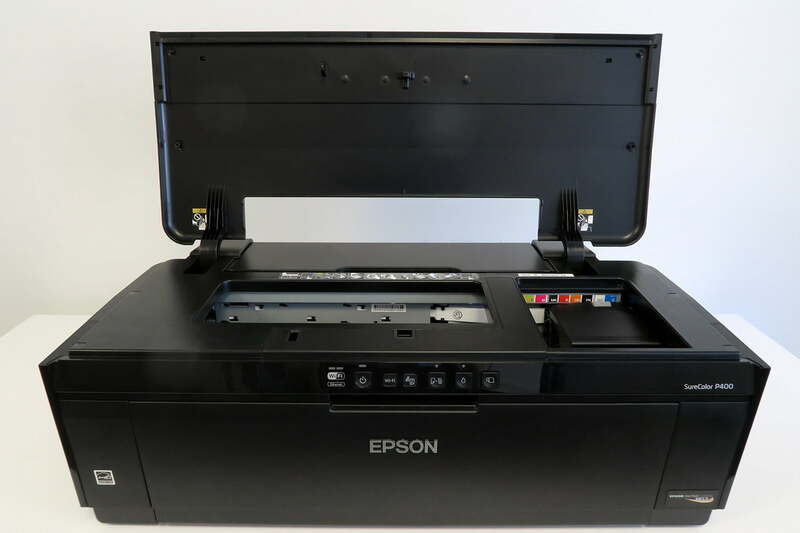 (A comprehensive 173-page user’s guide can be downloaded from Epson’s website). 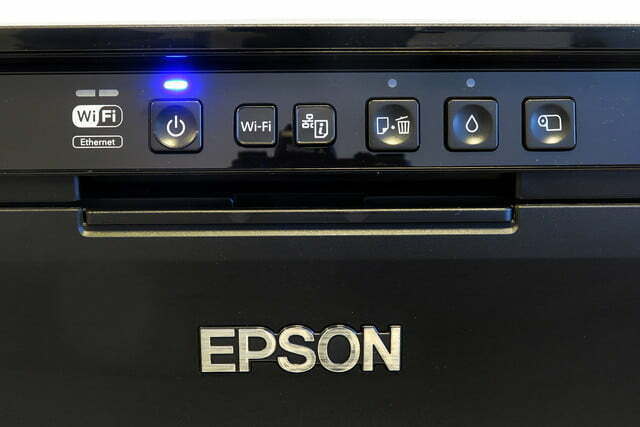 Not included is a disc containing drivers and software; you will have to download them from Epson’s support site. This is common with many printer vendors these days, but it assures that you have the newest versions of drivers and firmware. Other than the power cord, the box contains no USB or Ethernet cables. As an introduction to “prosumer” wide-format photo printing, the P400 has a lot going for it. The seven color inks give a wide color gamut and excellent definition in shaded areas. The Gloss Optimizer smoothes out the finish so there are no flat spots in the output. And the ability of the P400 to handle pretty much any media type up to 13 x 19 inches, including printable optical media and roll paper, is a definite plus – although, given the fixed position of the roll paper brackets, if you’re using roll paper it’s 13 inches or nothing. Whatever cons we have with the P400, they aren’t deal-breakers. Yes, the P400 is an excellent photo printer with a good balance of price, features, and performance. More importantly, it produces great-looking photos. 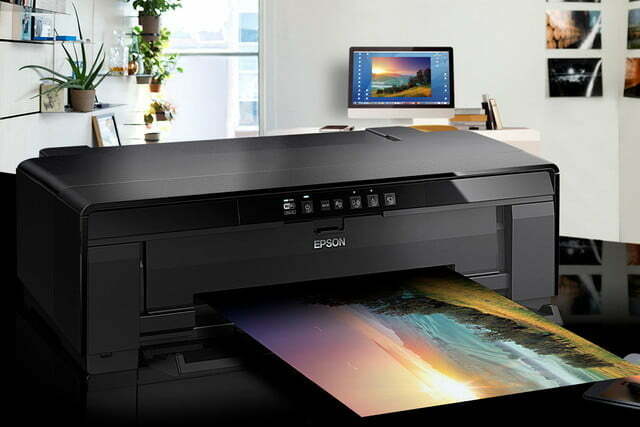 When it comes to wide-format art photo printers, both Canon and Epson offer excellent models. It won’t produce gallery-quality prints, but it comes close, and you’ll be happy with the output. There are Canon printers that offer similar features – multiple inks and 13 x 19-inch media handling. The Pixma Pro-10 and Pixma Pro-100 are two of Canon’s prosumer printers. The Pro-10 is about $100 more expensive than the P400, offering 10 ink colors and a wider color gamut; the Pixma Pro-100 uses eight colors of ink and priced about $200 less than the Epson. However, neither of these Canon printers offer the ability to use roll paper, which may be a minus, if you anticipate doing a lot of 13 x 19-inch prints. 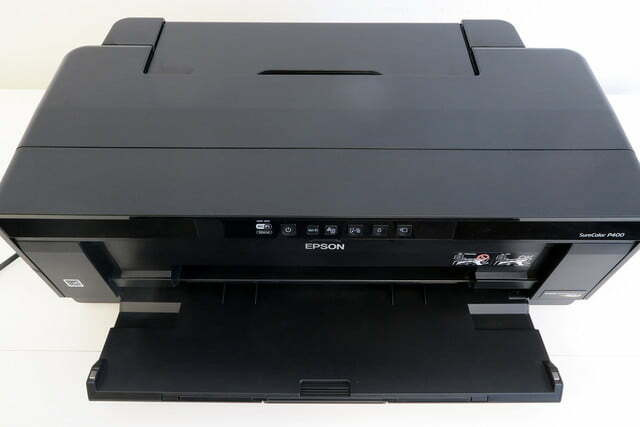 Of course, there’s also Epson’s P600 to consider. At $200 (MSRP) more than the P400, it comes with a few extras, like a touchscreen and support for mobile printing protocols. More enticing is the extra ink tank. But we think the P400’s output is damn good, and would be hard for many people to differentiate from the P600 unless pointed out. Doing without the other extras could yield significant savings. You can certainly spend more money on a prosumer wide-format printer. But if you are dipping your toes in the water, the P400 is good step to take. While it’s difficult to predict this, we can use historical references. Keep in mind that the two competing Canon printers mentioned were introduced several years ago (we’re still using our Pixma Pro-10), and the SureColor series was only introduced last year (the P400 was introduced just this year). Expect to have a useful life of at least four-to-five years of moderate use; add one-two more years for occasional use, but anticipate approximately three years for heavy-duty usage. As for the ink, again, this depends on your usage. But it will cost you $18 to replace each color. Warranty is the basic one-year. 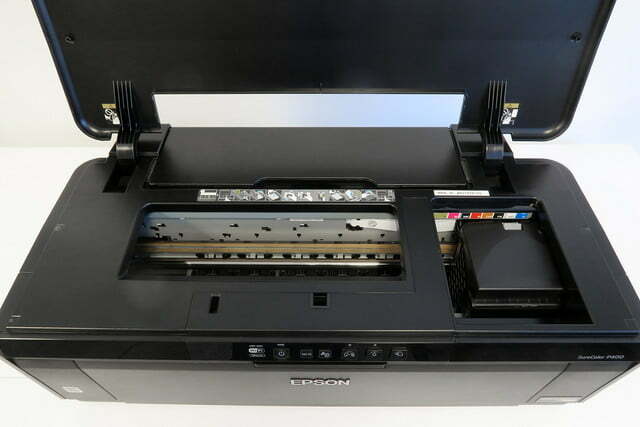 Epson does offer an extended warranty that adds another year, which covers replacement or repair, for $56.